What's inside a TTL chip? 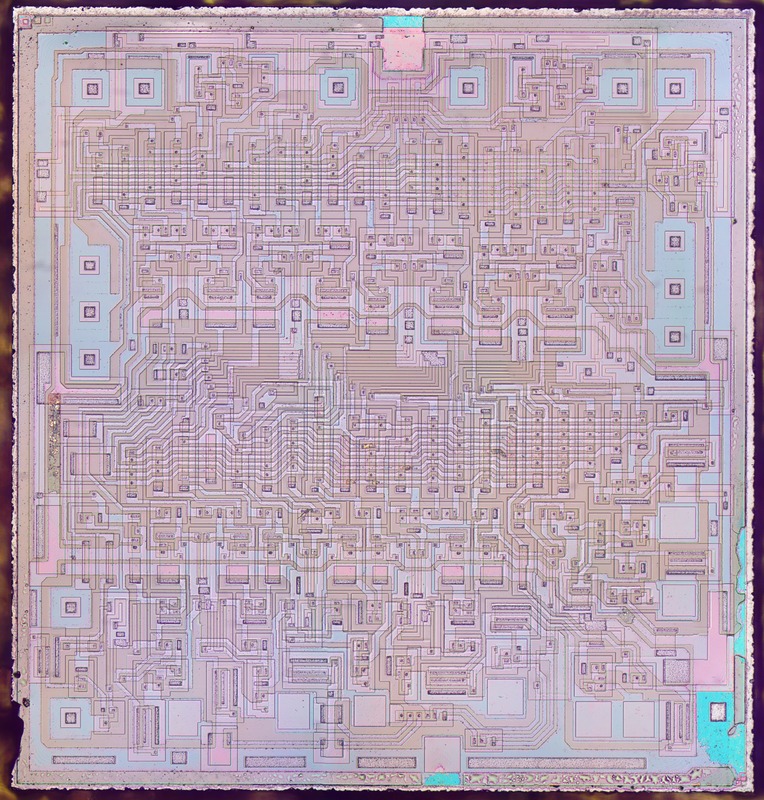 To find out, I opened up a 74181 ALU chip, took high-resolution die photos, and reverse-engineered the chip.1 Inside I found several types of gates, implemented with interesting circuitry and unusual transistors. 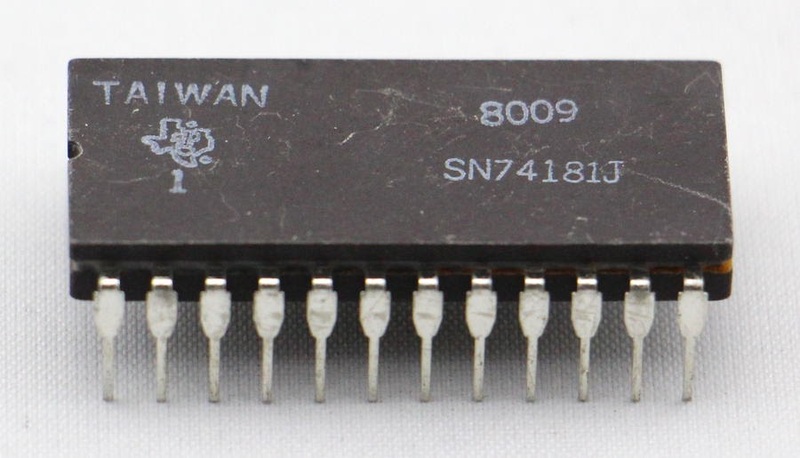 The 74181 was a popular chip in the 1970s used to perform calculations in the arithmetic-logic unit (ALU) of minicomputers. It is a moderately complex chip containing about 67 gates and 170 transistors3, implemented using fast and popular TTL (transistor-transistor logic) circuitry. The 74181 die photo is below. (Click the image for a high-resolution version.) The golden stripes are the metal layer that interconnects the circuitry of the chip. (It's not gold, just aluminum that looks golden from the lighting.) The white squares around the edge of the die are the pads that are connected by tiny bond wires to the external pins. Under the metal layer is the silicon that makes up the chip. Faint lines show the doped silicon regions that make up the transistors and resistors. While the chip may appear impossibly complex at first, with careful examination it is possible to understand how it works. Die photo of the 74181 ALU chip. The 74181 is built from bipolar NPN transistors, a different technology from the MOS transistors in modern processors. The diagram below shows how an NPN transistor appears in an integrated circuit, along with a cross section. The transistor has three connections: the collector, base and emitter, with metal lines for each. The collector is connected to N-type silicon, the base to P silicon, and the emitter to N silicon (giving it the NPN structure). On the chip, you can recognize the emitter from its nested squares, the base because its silicon region surrounds the emitter, and the collector because it is the largest contact. 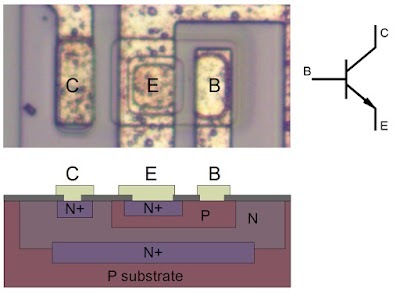 Structure of an NPN transistor appears in an IC. The key idea of the NPN transistor is it acts as a switch between the collector and emitter, controlled by the base. Normally there is no current flow between the collector and the emitter, so it's like a switch in the "off" position. But if you pass a small current from base to emitter, the transistor allows a large current from collector to emitter, like a switch in the "on" position. (This is vastly oversimplified—bipolar transistors are much more "analog"—but should be enough to understand how the 74181 works.) At the right is the symbol for an NPN transistor with the collector, base and emitter labeled. 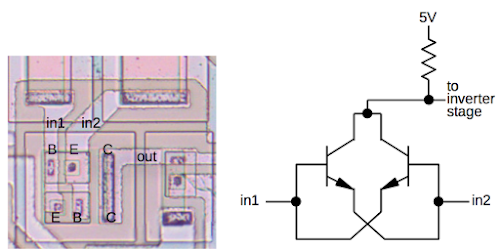 The diagram below shows an inverter in the 74181 chip. The 5V and ground lines run vertically along the left, powering the inverter. The transistors are highlighted with boxes. The resistors are visible as long strips of doped silicon snaking around.11 An input pin (A0) is wired to the pad. 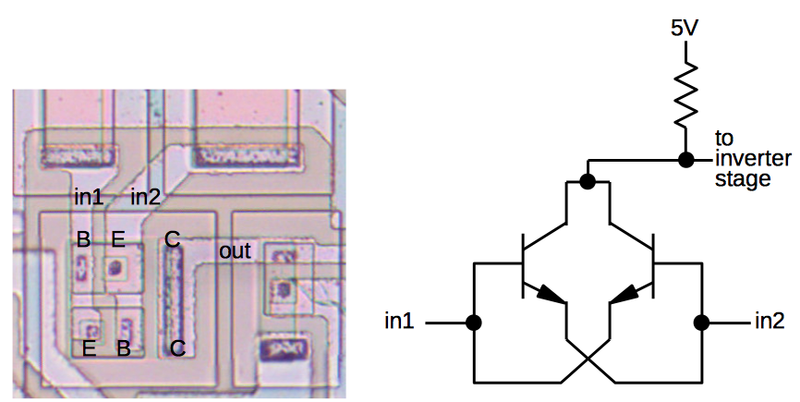 On the right is the schematic for a TTL inverter10, with components highlighted to match the die photo. An inverter in the 74181 ALU chip, along with a schematic showing the components of the inverter. The schematic below13 shows the circuitry of the 74181. 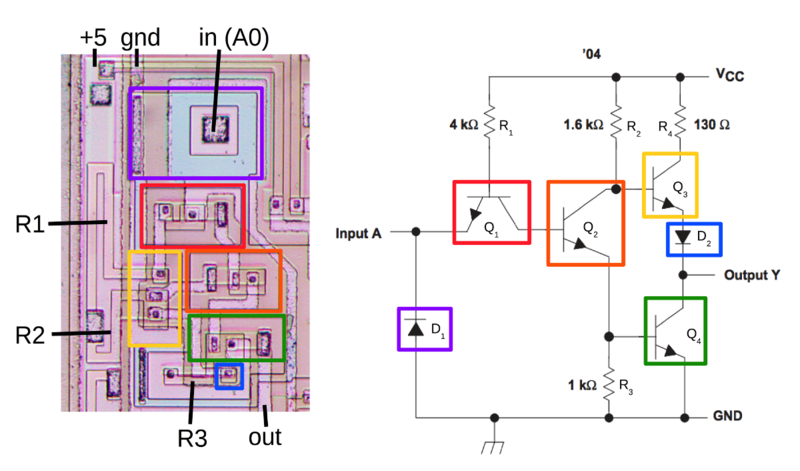 If you've taken a digital logic course, you've probably seen how to build a full adder circuit. But if you look at the schematic of the 74181, it's implemented in a very different way, to provide higher speed and more flexibility.8 The main reason for its complexity is it computes everything in parallel, rather than waiting for the carry to ripple from bit to bit, and this requires a lot more logic. The different types of gates are highlighted. There are a few inverters (red) to invert input signals. Most of the logic consists of AND-OR-INVERT gates. The AND stages are shown in blue, and the OR-INVERT (NOR) stages in green. (Some of the OR-INVERT stages are not explicit on the schematic and are empty boxes.) 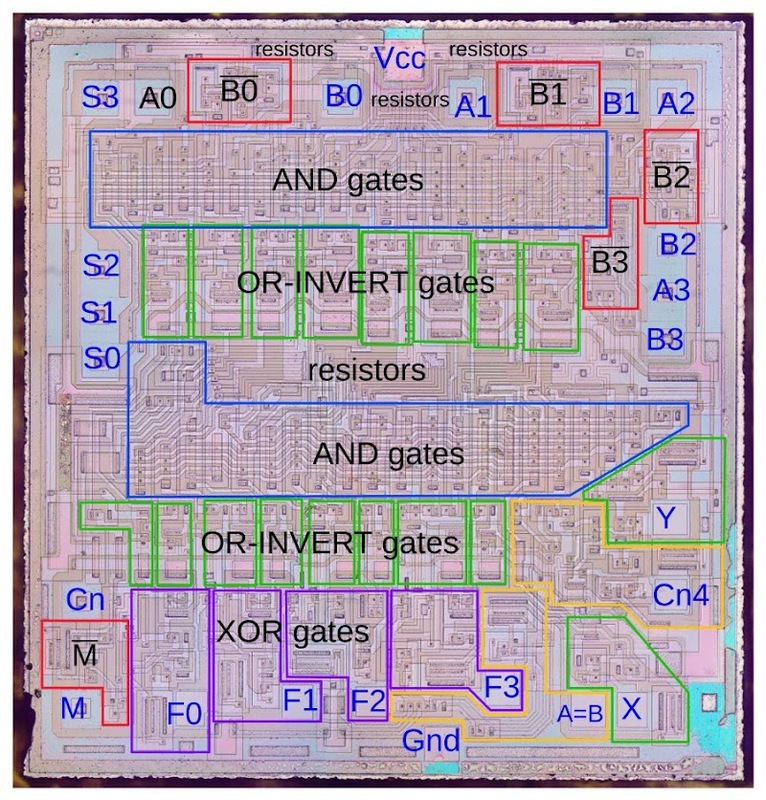 The chip uses a few XOR gates (purple) to compute sums. Finally, there are a couple unique gates shown in yellow. Schematic of the 74181 ALU. 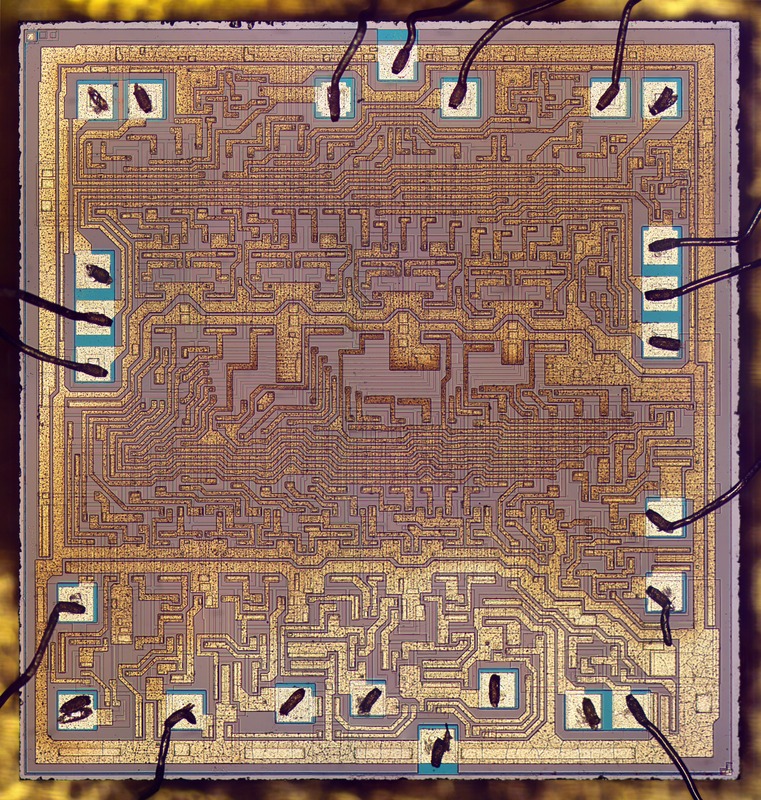 The 74181 ALU die, with main gate types outlined. Most of the 74181's logic is implemented with AND-OR-INVERT gates, which consist of AND gates connected to a NOR gate as shown below. After seeing the inverter, you may expect that an AND-OR-INVERT gate is very complex. But as the schematic below14 shows, the AND-OR-INVERT is not much more complex than an inverter, requiring just a few more transistors. 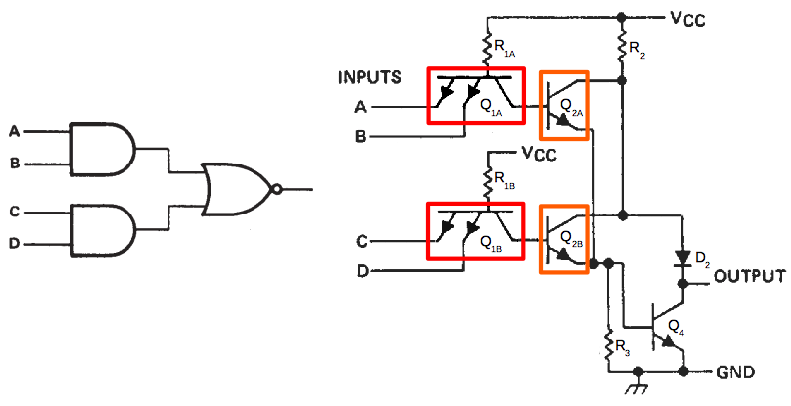 An AND gate is implemented by adding more emitters to the current-steering input transistor (red). 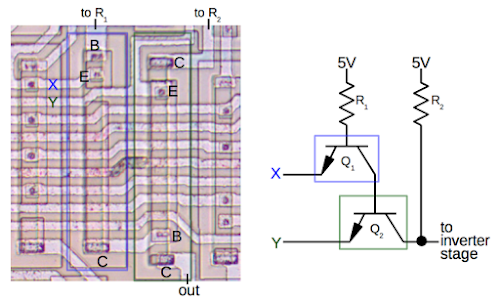 (This may seem very strange, but transistors with multiple emitters are common in TTL circuits.) If all inputs are high, the base current will be steered to the collector. Otherwise, the base current will flow out the emitter. Thus, the AND of the inputs is generated. The NOR gate is implemented by putting phase splitter transistors in parallel (orange). If any of the bases are high, the corresponding transistor (Q2A or Q2B) will conduct, pulling the output low. While the circuit below has two AND gates, it can easily be extended to as many gates and inputs as desired. The AND-OR-INVERT circuit from the 7451 chip. 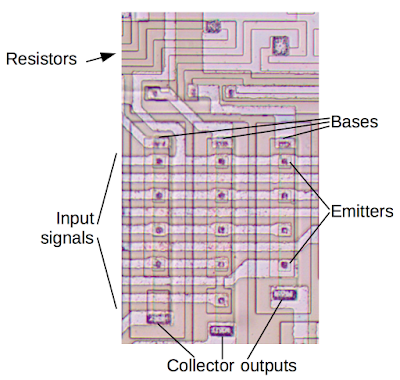 The multiple-emitter transistors that implement AND are highlighted in red. The transistors that implement OR are highlighted in orange. 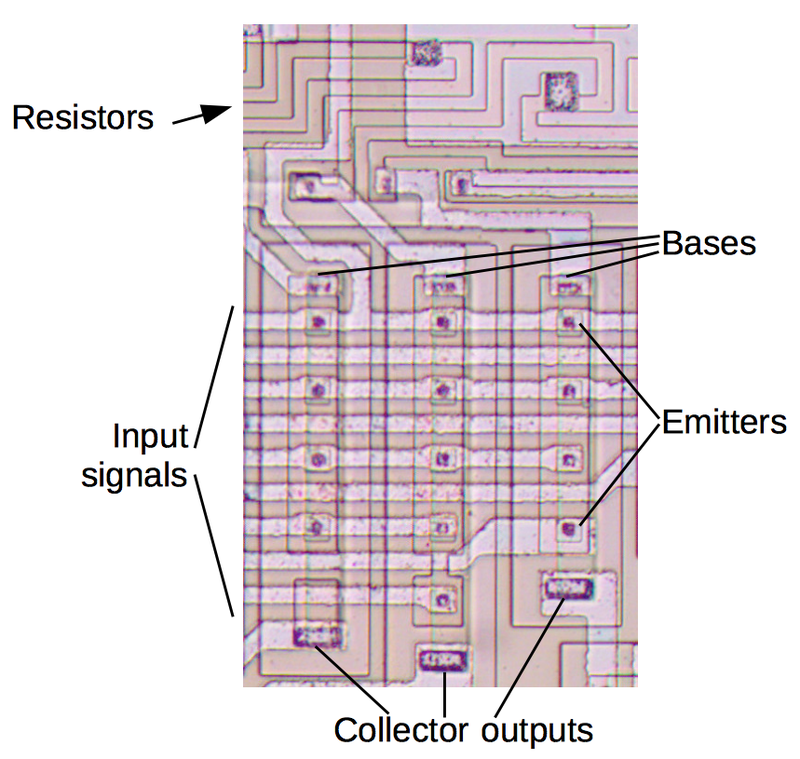 The diagram below shows how these multiple-emitter transistors are implemented on the chip. Three of these transistors are shown, each with four or five emitters (the dark squares), creating 4-input or 5-input AND gates. Each transistor's base is at the top and each collector is at the bottom. The signal lines run horizontally, with emitters connected as needed. With this structure, multiple AND gates can arranged efficiently on the chip (similar to a Programmable Logic Array or PLA). Note that the base resistors take up a significant amount of space. Three AND gates in the 74181 ALU chip. Each one is a single transistor with multiple emitters. The diagram below shows how the OR-INVERT part of the circuit appears on the chip. 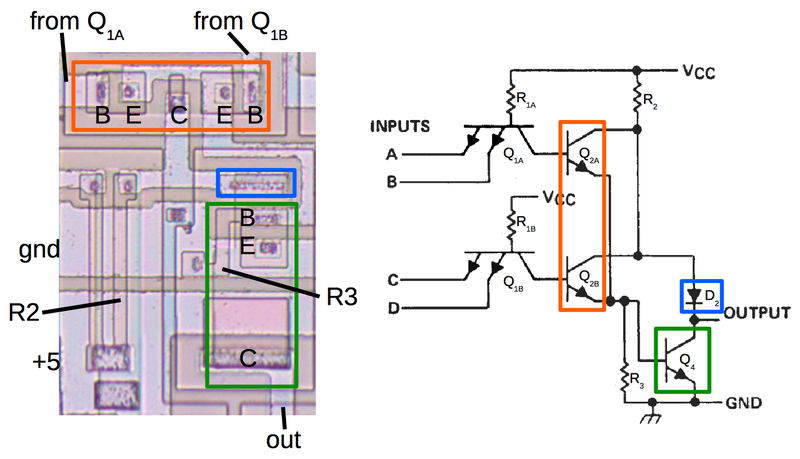 Note that Q2A and Q2B (orange) share a collector, so the two transistors don't take up much space on the die. Their inputs come from AND circuits such as the ones above. 3-input and 4-input OR gates are implemented similarly, by adding more transistors. The OR-INVERT stage of the AND-OR-INVERT gate in the 74181, compared with the 7451 AND-OR-INVERT gate. The chip uses a clever, compact circuit to compute XOR with two transistors wired in an unusual way: the emitters and bases are tied together and there is no connection to ground. The way it works is if the first input is high and the second is low, the first transistor turns on due to the base-emitter current. This pulls the output low through the transistor, with the second input acting as ground. Likewise, if the first input is low and the second is high, the second transistor turns on and pulls the output low. If both inputs are the same, there is no base-emitter current, both transistors remain off, and the output is pulled high by the resistor. The output from the transistor pair goes to the standard inverter stage, so the resulting signal is the XOR of the two inputs. 15 As with OR-INVERT, the two transistors share a collector, making the layout more compact. The circuit used in the 74181 to compute XOR. Layout inspired by userbinator. A few things to note about the photo. The two transistors share a collector, which is equivalent to wiring their collectors together. The pull-up resistor doesn't appear in the photo; it is off to the right. The inputs to the XOR are from AND-OR-INVERT gates; their output transistors are at the top of the photo. 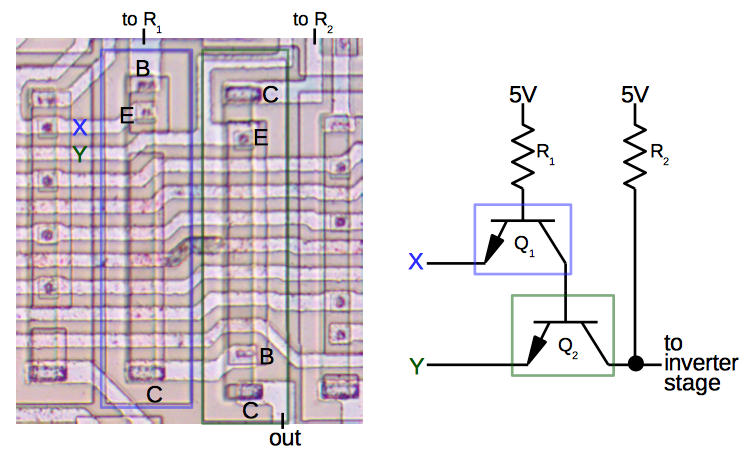 The chip uses four AND gates that have one inverted input.17 On the die, it appears at first that the gates are implemented with the standard AND transistors, but an interesting trick is used to invert one of the inputs. Transistor Q1 is wired in the normal current-steering way, with R1 providing a base current. But transistor Q2 has its resistor connected to the collector, not the base.16 Normally R2 will pull the output high. But if input X is high and input Y is low, R1's current will go through Q1's collector and Q2's emitter, turning on Q2 and pulling the output low. Thus, the result after the inverter stage will be X AND NOT Y. The 74181 uses an interesting circuit to generate NOT-AND. It uses the multi-emitter transistors but in a subtly different way from the AND gates. To create die photos, the integrated circuit package must be opened to expose the silicon die inside. Most chips have an epoxy package, which can be dissolved in boiling sulfuric acid. Since I don't like boiling acid, I obtained the 74181 chip in a ceramic package, which is much easier to open. The 74181 ALU chip in a ceramic package. I tapped the chip along the seam with a chisel, splitting the two layers apart. 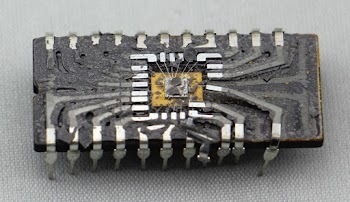 Below, you can see how the metal pins are mounted between the layers, and are connected to the silicon die with tiny bond wires. By tapping the 74181 chip with a chisel, the ceramic package can be popped open. 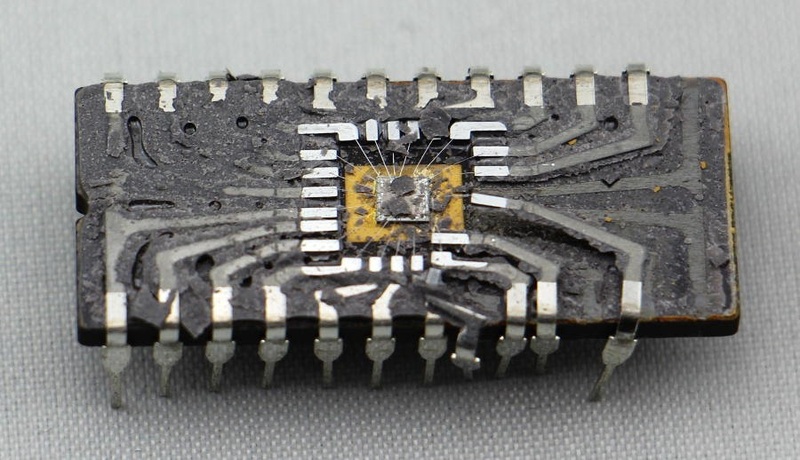 Removing the metal layer of the 74181 chip with HCl reveals the silicon layer underneath. 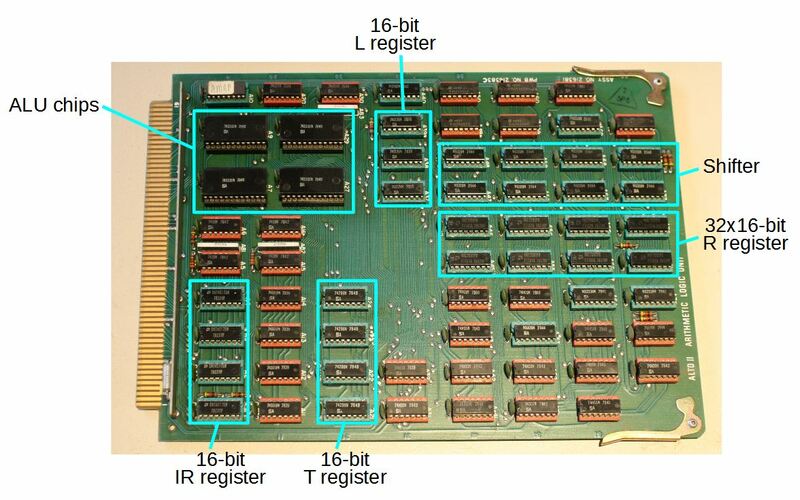 The 74181 ALU chip is a complex, high-performance TTL chip that was a key component in the processor of many minicomputers. I took detailed die photos of the 74181 ALU that reveal how the chip works internally. 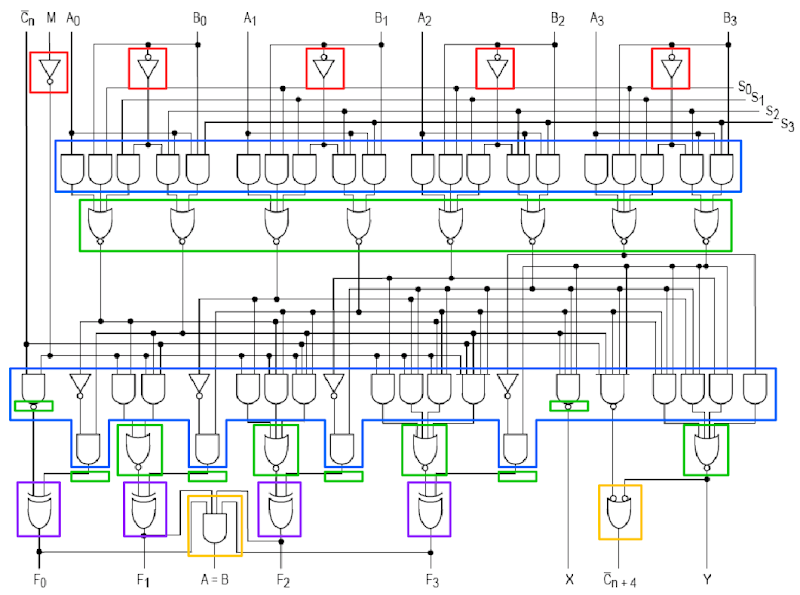 It uses several different logic gates, primarily AND-OR-INVERT gates that have an efficient layout on the chip. These gates are implemented by extending an inverter circuit in different ways, but are more complex than their MOS equivalents. I plan to explain how the 74181 implements its 32 functions and fast carry in a future article, so keep watching. Hats off for the whole study, and for making such an understandable article ! Regarding the missing right-shift: Given that one can simulate a left-shift with `A+A`, it's possible to simply reverse the order of bits in `A` to get `A'`, calculate `A'+A'` and reverse the bit order of the result, no? Amazing article, thanks a lot for this. I specifically enjoy the "real engineering" aspect of the article. It clearly outlines the fairly wide gap that exists between various book implementation of TTL logic gates and the actual implementation in an industrial/commercial device (in other words, the part that never gets taught in unis and you have to wait to start in industry to actually learn). Anonymous: yes, you do a right shift by reversing the bits and doing a left shift, but that would require several more chips, which is inconvenient. At that point, it's easier to implement a shift operation by bypassing the 74181 and shifting the bits directly. In this picture of the ALU board from a Xerox Alto, you can see the 8 chips they used to implement shift and rotate operations. Do you have an Acrobat version of this write-up? I'd like to use it in my logic design class as an example that touches on many topics. Please let me know. Incidentally, I'm on the Silicon 'arm' committee with the Computer History Museum and your name has come up more than once! Thanks for giving us a look inside one of those wonders. I used them in sophomore build-a-computer lab and they saved an awful lot of wiring back in the early 70s. 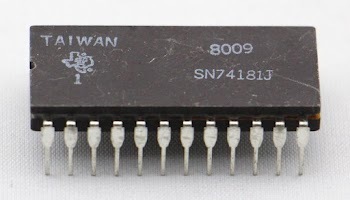 If I remember, there was a follow up chip, the 74281 which was a 74181 with a barrel shift inside. I'll bet if you popped one open, you'd see the old 74181 layout inside. Conway and Mead didn't come out until the late 70s. P.S. This is probably the last generation that can do stuff like this, or maybe not. In fifty years will someone be popping open an A12 ARM processor and pointing out the parallel look ahead buffer and the clever way the design software laid out the transistors? I'm curious how you etched through the passivation layer to get to the metal. TTL chips of this period would typically have had a quartz layer over everything except the bond pads. How many active components you can count on? I have estimated 180-200. Also: there is much unsolved debate whether the 74181 feature was first invented by Texas Instrument or it was born from a Fairchild custom design. Do you have any information about it? I saw that you linked my site (APOLLO181). Thank you. Can I import the die picture in my site with proper copyright and references to you and your site? Eventually I'd like to stay in touch with you by email. Here it is explained by me how to make a left shift with 74181. David Thomas: I was quite surprised that there was no passivation layer. I put HCl acid on the die to remove the bond wires, and it removed all the metal! Maybe passivation isn't as important for TTL? (Does anyone out there know?) For MOS chips, I've removed the passivation with Armour Etch Glass Etching Cream, which I got at a craft store. Ken, thank you for this Amazing blog! !